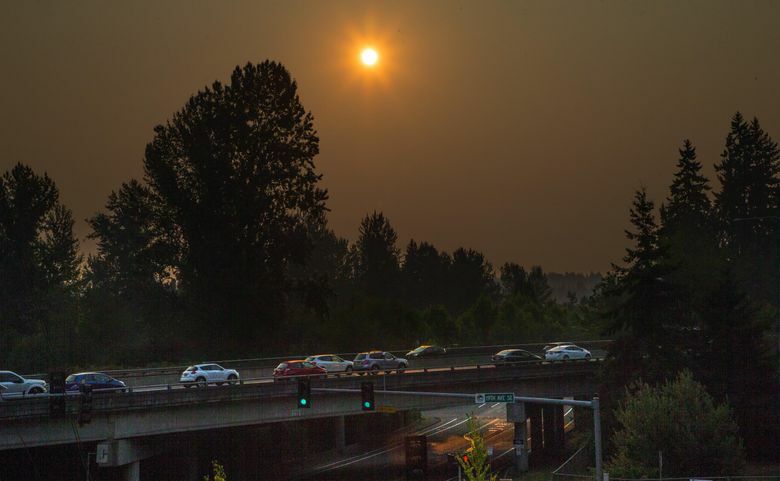 The haze that's settled upon the Seattle region could last into next week. Here are some tips to keep safe from the unhealthy air. The smoky haze from wildfires in Canada that’s languishing over the Puget Sound has caused some serious health concerns, and not only for people with lung issues, according to air-quality experts. In fact, even short-term exposure to the kind of particulate matter that’s expected to be in the air here until at least the middle of next week is associated with an elevated risk of heart attack and stroke, according to the American Heart Association. For people who wish to use a face mask to reduce the intake of particulate matter, Dr. Rick Bowles of the Pacific Medical Center in Seattle recommends purchasing a high-efficiency particulate air filter (HEPA) that’s rated as filtering out 99 to 100 percent of the most penetrating particle-size material. Don’t be an exercise addict, Bowles said. Sure, exercise is good — even great — for you. But too much of a good thing on a day with smoke in the air can be dangerous. If you cannot skip a day, at least try to get to the gym for your workout, he said. And if even that is too much to ask, well then at least protect yourself from the heat, if not the haze, by exercising in the earliest morning hours. People with asthma, emphysema and other lung ailments should keep necessary and recommended medications at hand. Carry rescue inhalers on your person or in your car, he said. Stay hydrated. Keep a glass of water with you and sip from it all day. Keeping hydrated reduces the amount of smoke that can travel deep into your lungs. Wear loose and light-colored clothing, Bowles said. Recognize the signs of heat exhaustion and heat stroke: confusion, weakness, dizziness, fainting, fatigue, dark urine, headache, nausea, sweating and cramps. Bowles warned that heat exhaustion and heat stroke can be “very serious and can be exceedingly dangerous,” especially to infants, young children and older adults. If a heat-related illness is suspected, get the affected person to lie down and try to lower their core temperature by getting fluids into them and placing cool, wet rags on their body, Bowles said. Keep windows and doors closed. If there is no air conditioning and it is too hot to keep windows and doors closed, consider leaving the area. Run an air conditioner (if you have one), set it to re-circulate and close the fresh-air intake. Make sure to change the filter regularly. Use a HEPA filter to reduce indoor air pollution. A HEPA filter may reduce the number of irritating fine particles in indoor air. A HEPA filter with charcoal will help remove some of the gases from the smoke. Don’t add to indoor pollution. Don’t use candles, fireplaces or gas stoves. Don’t vacuum, because vacuuming stirs up particles inside your home. Don’t smoke, because smoking puts even more pollution into the air. And if all else fails or you just feel too hot to manage, go to one of the city’s many cooling centers.